Monday morning we got our first frost. The day was crisp and sunny, but it's been cold and rainy ever since. Time for soup! I think most of us have a recipe or two for leftovers soup. I call mine "Scrap Soup." chopped fresh daikon greens and a pint jar of bone broth. Left to simmer all morning on the woodstove, the flavors meld wonderfully. It's deliciously warming and comforting. Usually there's enough leftover to become the starter for the next day's soup. and another pint of bone broth for a more soup-like consistency. I can soups too, often from small amounts of various garden produce when there isn't enough for a full canner load of any particular veggie. Photo from my "Just Add Noodles" Chicken Soup blog post. Home-canned soups are a wonderful convenience food, but this year I tried something different. We ate daily from the garden, but usually there were leftovers. The next day it seemed silly to heat up those leftovers when we had so many fresh vegetables to eat. So I got out one of the peanut butter jars I'd saved and started putting the leftovers in it. That jar went into the freezer. Almost every day I'd add bits of leftover vegetables, meat, rice, pasta, cheese, beans, gravy, broth, etc. By summer's end I had a dozen jars full of frozen odds and ends for soup fixings. Perfect additions to keep that soup pot going. Freezing those bits is a wonderful solution! Seems I never have much freezer space, but maybe I could squeeze a few containers in next summer. LOL, my daughter calls my soup, refrigerator soup. No two batches are the same because I throw whatever is in there, in the pot, add some onion, garlic and a can of diced tomatoes and call it soup. Michelle, I know what you mean about freezer space! But I'm thinking, though, that freezer bags could be used just as easily. And they wouldn't take up as much room as a jar or plastic freezer container. A nice way to deal with small amounts of leftovers! Judy, and isn't it always just the best soup! Waste not, want not! Fantastic nutrition in a jar . . . and then the bowl! Aaah, a Preppers best meals. Simple quick and good! Mama Pea, of course food never truly goes to waste (compost, chickens, pigs, etc) but it certainly is nice to save it for ourselves! Mike, I should can these so I don't have to rely on the freezer! Quinn, there is something extremely rewarding about keeping that soup pot going! Plus it only gets better! Could duplicate them with a recipe. What a great idea just adding to a jar in the freezer! I used to save the water from steaming veggies (just cool first) and add to a 2-qt container in the freezer to use in soups. I like your idea too! Kathy, yes! I add that too. I use any liquid to fill in the spaces between the things I add to the jar. Waste nothing! Hi Leigh! What an awesome idea to collect veggies for soups. I love soup and you are right about the veggies during the garden harvests … much of mine went into the composter... I'll never do that again! Thanks for sharing that brilliant idea! Leigh - We just had our first cold snap - and had bean soup. There is something about soup for the first cold snap that seems to just fit. 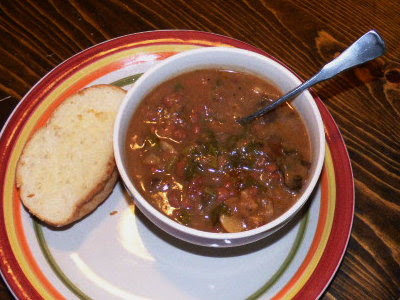 TB, bean soup is one of my favorites, epecially navy beans with bacon, yummy! My grandmother called it Mulligan Stew. No two are ever alike. She'd take leftover vegetables and put them in a freezer container (old Tupperware type bread keeper). When it was full, she'd make Mulligan stew. I once asked my father, "What's the difference between a soup and a stew?" He answered, "Whatever the cook says it is." I make this nonrecipe to this day. Yarrow, it's a great way to have soup at the ready! What a great idea! Living alone, I am often faced with small and large bits of leftovers that I just can't face. This would be the perfect solution - although the chickens would miss them. However, since the chickens seem to be on strike at the moment, I wouldn't feel half bad saving the leftovers for myself. Susan, yes, my chickens would probably enjoy the leftovers too, but I make sure they get plenty of other scraps. Having the fixings of a nice soup is too good to pass up! You have the greatest no waste ideas! I just read your 'scrap soup' post too and I am writing all of these down. I love not wasting but I am not as creative as you but now I have the idea and I'm going with it! I have used up things in the frig but usually found a recipe first. I also use a lot for pizza. You ideas are super and I love freezing the various waters and broths plus jars with frozen vegetable 'tidbits'. You are genius! Thank you so much! Chris, as much as I love soup, I love salads too. :) Great idea about cooking extra veggies for a roast! Sam, thank you! I figured I was probably the last person on the internet to figure this out, lol. I receive so many good ideas from others that I'm always happy when I can share one too. We have been enjoying soup as well...however Ralph loves his thickened with a slab of cornbread broken into chunks. After his addition its more like a very thick stew. The last batch had turkey, chicken and venison bits....it was rather good. Yours looks lovely. Fiona, I'm with Ralph. I love crackers or bread broken into my soup. I reckon because I like my soup thick rather than thin. :) Either way, it's a perfect place to use those bits of leftovers. Well this just seems brilliant. I've always saved soup fixings in freezer bags but never thought to actually portion them out in jars. Instead I had a bag of celery, bag of carrots, bag of bones, etc. Will definitely give this a try. I'm also strangely enamored of the idea of a rolling daily soup base. When we traveled in Ireland we were delighted by the "soup of the day" at the pubs which consisted of broth plus any vegetables leftover from the night before then immersion blended into a creamy soup. You're method combines that idea with a flavor base that will just build and get richer. Love it. Your comment about soups in Ireland is intriguing. I can't help but wonder if this isn't inherited from days gone by, when "pottage" was kept simmering on the fire for anytime someone was hungry. Good preservation method too. I like your idea of creaming with an immersion blender. I do like a thick gravy-type based soup. I can't believe I've never thought to do that, especially since I love eating soup in the winter. I'm going to have to rethink things around here!